For the chicken lover, grab McDonald’s McChicken for only $1.90 with this one time offer from 27 March to 1 April 2012. 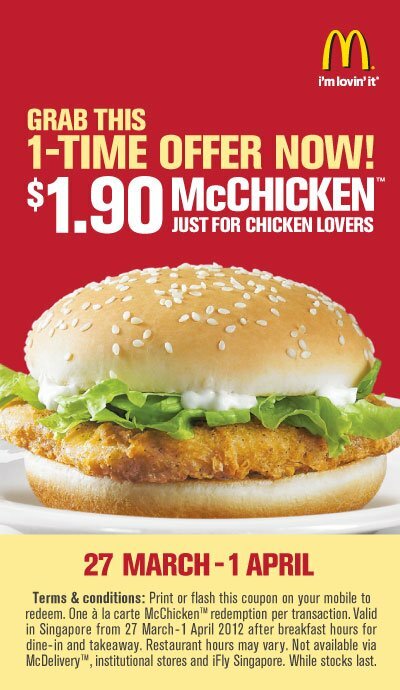 Easy way to redeem the McChicken, simply flash it on your phone or print and present to counter staff to ejoy the offer. - One redemption per one transaction. - Not valid via McDeliver, institutional stores and iFly Singapre. - Valid after breakfast hours from 27 March to 1 April 2012.